Apple is putting great effort into pulling its Maps application up to usual Apple standards. Alongside recent acquisitions, the company is seeking to expand its Maps team in charge of verifying mapping data. 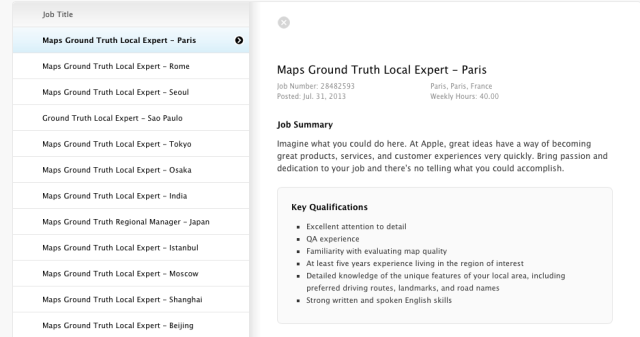 First spotted by MacRumors, the company has almost 40 job postings for “ground truth” local experts and regional managers in multiple locations across the globe from Paris to India, and from the US to the United Arab Emirates. The job description reads as follows. The Maps team is looking for people with a passion for mapping, great testing skills, and deep regional knowledge to help us build better and better maps. In this position, you will be responsible for the quality assessment of Apple Maps for your region, including both data and map services. You will monitor changes to our maps, provide feedback on unique local map requirements, collect ground truth information, and evaluate competing products. In order to qualify, applicants need to be familiar with evaluating map quality, and have detailed knowledge of the unique features of the local area, such as preferred driving routes, landmarks, and road names. As you can see from the above description, the available positions are clearly part of Apple’s effort to enhance the quality of its much-criticized mapping service, which, by the way, has already shown significant improvements. You may recall that Apple Maps was the target of harsh criticism soon after launch, triggering a letter of apology from Tim Cook, and motivating Google to improve its Google Maps app for iOS. Apple has been making moves to improve its mapping service through acquisitions: it has recently acquired HopStop, and more recently Locationary.